Egypt and Sudan are in talks to boost bilateral security cooperation as part of wide-ranging efforts to improve relations between the two nations, Sudan News Agency (SUNA) reported on Saturday. According to SUNA, Egypt's acting intelligence chief Abbas Kamel visited Sudan at the invitation of his Sudanese counterpart Salah Abdullah Mohamed Saleh. 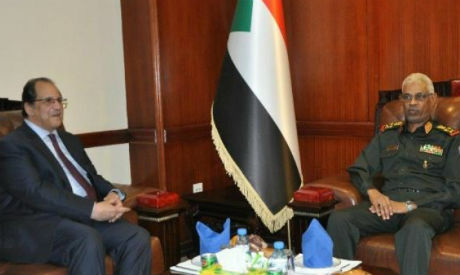 Kamel also met with several other Sudanese officials, including Foreign Minister Ibrahim Ghandour. Ghandour asserted the importance of coordination to settle various issues, making use of the recently formed quadrilateral committee comprising the foreign ministry and intelligence heads of both nations. The committee was formed on the orders of Egyptian President Abdel-Fattah El-Sisi and his Sudanese counterpart Omar El-Bashir. Kamel said that there is a strong determination to create the circumstances for a return to normal relations between the two countries. According to a statement from the Sudanese armed forces, Kamel met with the Sudanese defence minister, Lt. Gen. Awad Mohamed Ahmed bin Awaf, with the two discussing the main challenges facing the region. "The major challenges facing the region force us to communicate and respond rapidly to different issues in order to resolve them, so they don't become obstacles affecting the relationship between the two countries," Kamel said, according to the Sudanese armed forces statement. Kamel also said that the principles of honesty and transparency were agreed upon in relation to matters of mutual interest, and he expressed his optimism on the future of Egypt-Sudan relations. Sudan's Bin Awad described the relationship between the two countries as important and strategic, accentuating the essential nature of communication between their security bodies. "Egyptian national security represents the security of the nation, and it's a duty to preserve it," he said. Kamel's visit comes days after the Sudanese ambassador to Cairo returned to Egypt last week, nearly two months after being recalled to Khartoum due to an apparent heightening of tensions between the two nations. The government of Sudan offered no public explanation at the time of the ambassador's recall. However, relations had been strained due to Sudan’s claims of sovereignty over Egypt’s southern Halayeb Triangle region, as well as the Sudanese stance in the talks on the Grand Ethiopian Renaissance Dam. In February, a newly formed committee, comprised of the foreign ministers of Egypt and Sudan along with intelligence-agency heads, met in Cairo to "remove any flaws that could hamper this brotherly relationship, solidarity, and unified destiny in the face of bilateral challenges."